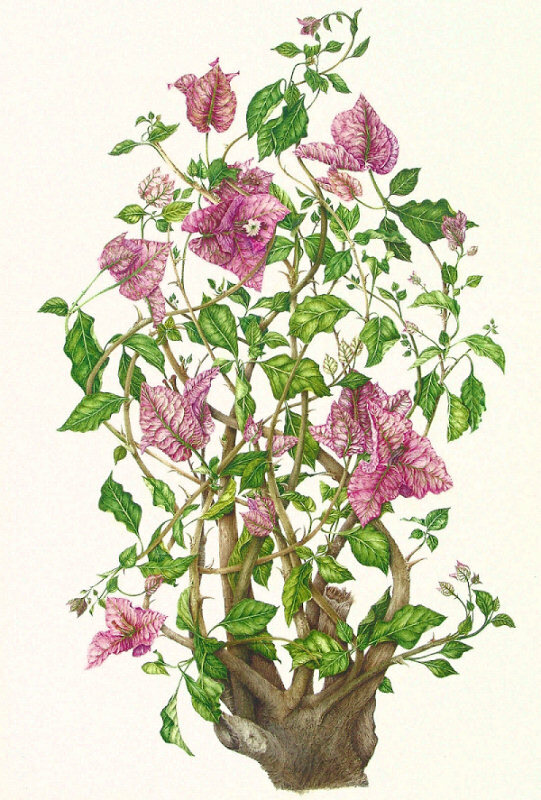 Bougainvillea was discovered by French botanist Philibert Commers on the coasts of Brazil, in the 1760’s. Commerson was was an avid collector of botanical specimens and sometimes called a lunatic and a magpie of exotic plants. Despite being a poor sailor he voyaged around the world in his botanical quest. In 1766 Louis-Antoine de Bougainville (1729-1811), lawyer, mathematician, and explorer, joined the French army to serve with Montcalm in Canada so that he would not have to follow his father’s profession of notary. As a French naval officer he undertook an around-the-world expedition which successfully returned to France in 1769. Commerson, one of the three scientists he hired, was allowed to bring a personal servant and so it was that 25-year-old Jeanne Baré boarded ship disguised as a man. ‘Jean’ served as valet and assisted Commerson with the collection, preparation and documentation of the plant specimens. On the shores of Brazil the two discovered the flamboyant climber which Commers named Bougainvillea to honor his friend. It was only after theexpedition landed in Tahiti that Jeanne’s masquerade was discovered. When she finally returned to France she was the first woman to have circumnavigated the globe. Various species of bougainvillea now commonly found across the globe—from the islands of Grenada, Guam, Taiwan and the Philippines, through the deserts of Rajasthan, from Portugal and Spain, to California and Florida—this thorny climber is a popular favorite.